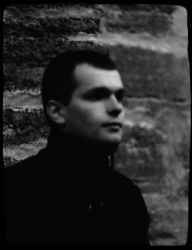 Swedish industrial ambient music project formed by Peter Andersson in 1991. He had an awesome period from mid-90s until early 2000's, but then took a direction that doesn't really talk to me. It seems he mostly abandoned the dark melodies that were so great in the peak period, and turned more into mechanical clattering and random unmusical movements that don't move. Which is a shame, since at peak it's one of the best dark ambient projects I've ever heard. I remember seeing Peter at a live performance together with Arcana and Moon Lay Hidden in my hometown sometime in the mid 1990:s. They switched off all the lights in the room, turning it completely pitch black. Then suddenly his face appeared bent over a synthesizer illuminated by a small spotlight, kind of a like a reading lamp. He then proceeded to press a few buttons, the music started playing, and then he uncorked his first beer! I guess performance isn't the exact word; it's hilarious when thinking back, but at the time I wasn't very impressed.